It's been a long time since I've gone an entire day eating a primal diet, like the one that made me feel so great in the summer of 2011. This is mainly due to convenience issues, indulgence (if I'm being perfectly honest with myself), and certain health reasons I'll talk about at another time. I've been pretty good about cutting out sugar, although I have my days, but I am looking forward to getting back to eating primal again. That said, I truly recognize the value of a nutrient-dense diet, and I want Will to appreciate that too. He's a very strange eater, and his tastes seem to change from day to day. For example, he rarely likes meat, so a lot of the protein he gets is from eggs, nuts, and dairy products. I do what I can. On the whole, I'd say he eats a pretty balanced diet. And when I get a chance to feed him a snack, I try to not let it be an empty one. 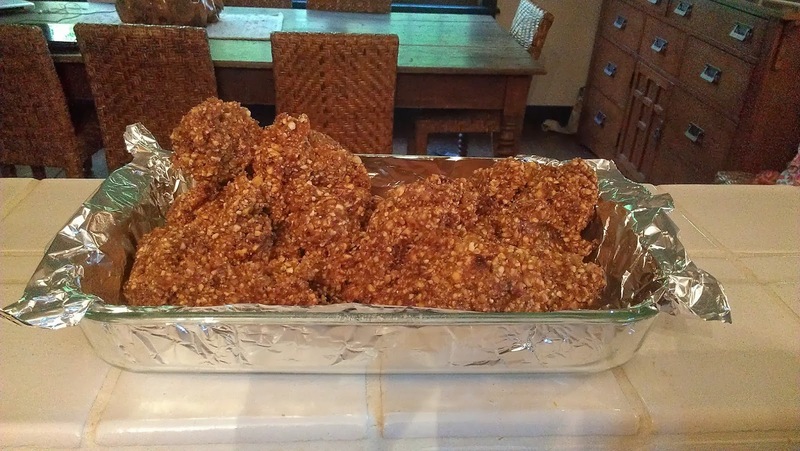 That's why I love these date bars, and I make them often. Brian and Will both love them, so I try to keep a bunch on hand. They're similar to Larabars, but I much prefer these. They taste fresher. I keep them in the freezer (Brian likes them frozen, and tiny, frozen date-bar squares also appeal to my little teether) but they're shelf stable to a point, so I can throw a couple in my diaper bag if I'll need a snack. 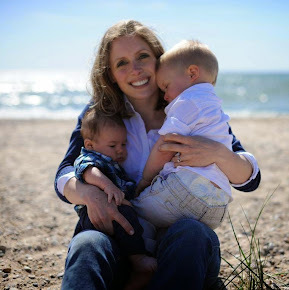 They're a good source of healthy carbs for growing babies - without nut allergies, of course. The process is VERY easy if you have a food processor and a stand mixer. If you don't... honestly, then they're not that easy. Process your dates and dried fruit (if using) to a sticky paste. Microwave the fruit until quite warm (two minutes?) and then transfer to stand mixer with ground nuts. Press down flat with lightly oiled hands. 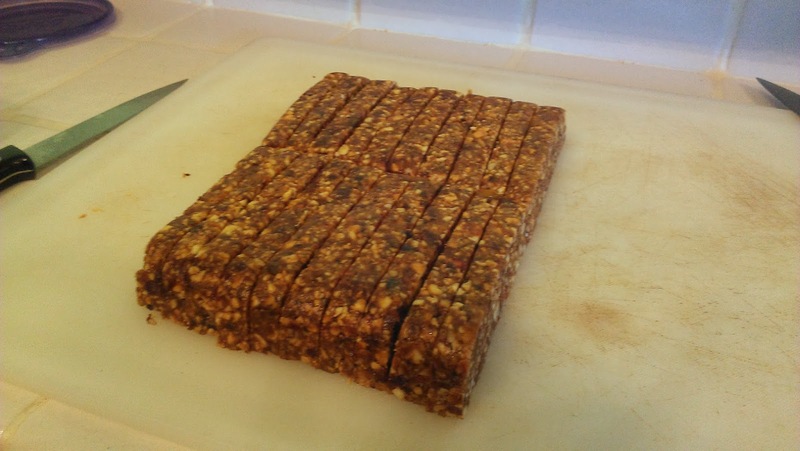 Let cool for at least an hour, then turn out and cut into bars with a large, lightly oiled knife. Wrap individually if desired. (I've tried throwing them all into a ziploc and freezing, but they don't come apart after they've frozen into a big clump.) I like using the folding sandwich bags for this. See? Verrrrry easy. If you have a professional-size KitchenAid, you could easily make a double batch at one time. I have a 5 qt. size and all my attempts to double the recipe at once have turned very messy. 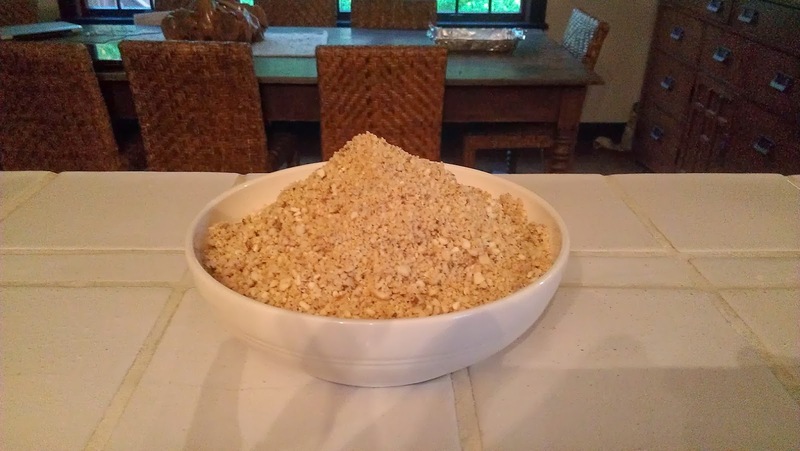 I always make a double batch but I process and mix the two batches separately, thus ensuring that the ingredients don't fly out of my stand mixer all over my kitchen. 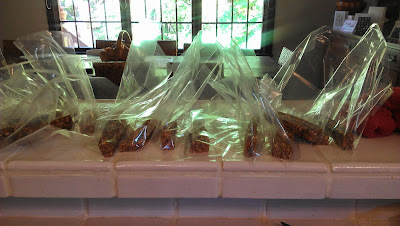 One batch makes about two dozen Larabar-sized bars, so today I ended up with about four dozen, which will last us quite a while. *Feel free to get creative with your fruit choices. I usually stick with cranberries and apricots, but I also love dried apples and raisins (with cinnamon and nutmeg!). Dried cherries, though expensive, would be fabulous. Your choice of nuts will also affect the final flavor. I think mini chocolate chips/dark chocolate chunks would taste awesome too, but I haven't ever added them (though I might if I make these for a gift). If adding chocolate, though, I wouldn't microwave the fruit. Another quick note: Sometimes I don't have a full pound of dates for a batch. On this particular day, I only had 12 oz. per batch. 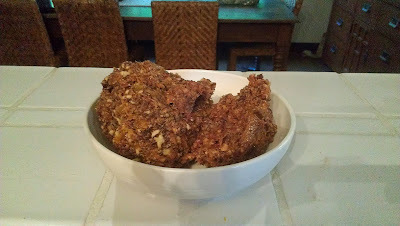 So I substituted a sticky dried fruit blend in order to end up with the pound and a half of dates/fruit required. See, some dried fruits are more sticky than others (apricots vs. apples, for instance). What you want to remember is that you need at least a pound of stickiness to hold the nuts together, and then the 8 oz. of whatever you have on top of that will help also. Hope that makes sense. 1. Process the nuts finely. 2. Process the dates and dried fruit to a rough paste. 3. 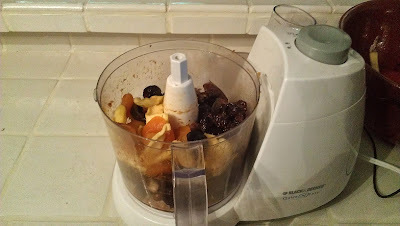 (Optional) Microwave the dried fruit and dates for a minute or two to make them looser and easier to blend. 4. 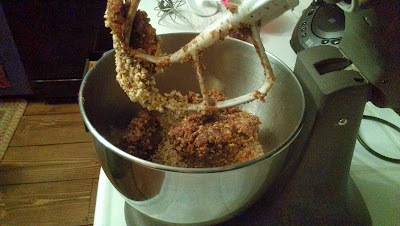 Transfer nuts, date mixture, and any additional spices to the bowl of a stand mixer fittted with the paddle attachment. Mix on low until combined, scraping the sides or paddle as necessary. 5. Prepare your pan. 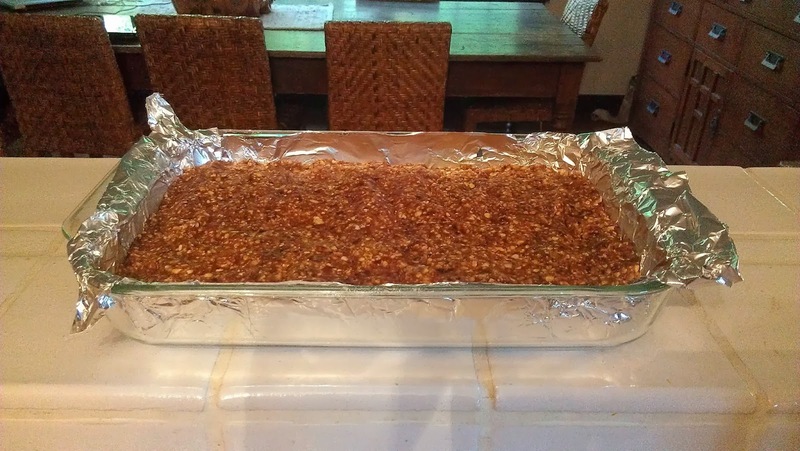 Line with either lightly oiled aluminum foil, OR drizzle a teaspoon of water into the pan and then line with plastic wrap (the water between the pan and the plastic will keep it from sticking together). 6. With lightly oiled hands, press the date bar mixture into the prepared pan. 7. Let solidify for an hour or more. 8. With a lightly oiled knife, cut into desired bar sizes. Wrap individually. Freeze for longest shelf life.